I went to see a late show tonight with Lan at the Edwards on Main Street. It's the 3D version of the critically acclaimed animated Tale of Beowulf. It's a fantasy set in 5th Century Denmark. 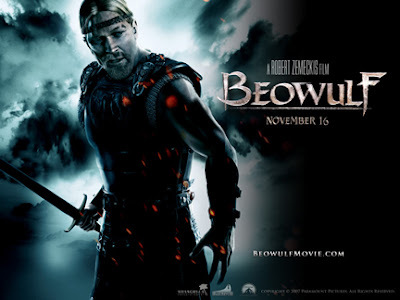 The main character Beowulf (Ray Winstone) must defeat Grendel (Crispin Glover), a monster to say the least, who's been terrorizing a nearby Kingdom ruled by Hrothgar (Sir Anthony Hopkins). It's your average Love, Infidelity, Seduction, and Action movie. It has all the elements of a boxoffice hit. Plus... it's an animation with life-like characters. Not only the voices of these great actors brought these characters to life on screen, the animation is phenomenal. It's by far better than say "Final Fantasy" animation because Robert Zemeckis and his DP (Director of Photography) turned this animation into a movie epic with artistic camera angles. During the fight scenes, Zemeckis utilized many creative camera angles through high tech CGI brought this movie to a new level in animation. To boot, we paid an additional $2 for the 3D version. We have not seen a 3D movie in a long while and they really improved on the glasses. We both wear glasses, and these 3D glasses sit comfortably on top of our regular glasses for 2 hours. I really think the extra $2 was worth the extra money for this movie. It really brought this very well made animation to life. Lan and I gave this a big 2 thumbs up!